It has been a big week for Tessa's tots! They were finally able to expand to a larger pen and they are using the litter box like pros with fabulous accuracy. They are also well on their way to being weaned. Normally we soak dry food in goats milk for a week or so before making the transition to dry only- but they did such a great job eating that they are already primarily on dry kibble. Mommy Tessa is still feeding them every now and then, but with their sharp little teeth she is staying out of their reach and will likely be completely done with feeding this week... but don't worry, our pack will help her with keeping them socialized and by teaching them manners (they are used to puppies)! Mr. Red: 3lbs 0oz/Mr. Red is a curious, cuddly little guy who enjoys being loves on and fed treats! Ms. Yellow: 2lbs 10oz/Ms. Yellow is too cute for words! She melts in your arms during cuddle sessions and has some serious puppy dog eye skills. Ms. Purple: 2lbs 10oz/Ms. Purple has pulled a 180... she was quite a vocal young pup but she has settled into a pretty quiet gal this week. She has a very expressive face and you can almost read her thoughts from her facial expressions. Ms. Pink: 2lbs 6oz/This precious girl is still just an absolute sweetie! We are also still impressed with her build, she reminds us of a litter golden retriever (without the high shedding coat). Mr. Black: 3lbs 0oz/Mr. Black is all boy and a rough and tumble type player- he likes to act tough but we all know he is actually a huge baby because he loves cuddles almost as much as he loves playtime. Ms. Green: 2lbs 6oz/This little bitty gal is still pretty chill compared to her littermates, but she has come out of her shell a bit this week and we are starting to see some small bursts of spunky play between naps. Mr. Blue: 2lbs 14oz/Mr. Blue is a stunner with his blocky build! He is quite photogenic with his block head and is solid in color all over. He is still pretty gentle and calm compared to his siblings. Mr. Orange: 3lbs 0oz/The smallest male in the group, Mr. Orange is a feisty player who makes up for his size by playing with gusto! Despite his ability to play confidently with his siblings, he likes to hang back in new situations and allows his siblings to explore first before he dives in. Mr. Red: 2lbs 12oz/This boy is so funny- he kind of has a "grumpy cat" look going right now because of his extra fluffy coat, which totally doesn't match his loving personality! Ms. Yellow: 2lbs 6oz/Ms. Yellow is a sweet combo of spunky and relaxed. Ms. Purple: 2lbs 2oz/This chick is already a diva! She is vocal and quick to let you know if she is uncomfortable. Ms. Pink: 2lbs 8oz/Such a sweetheart! This gal has a precious blocky face and enjoys being held. Mr. Black: 2lbs 14oz/This booger is full of personality, he is super playful and likes wrestling with his siblings. Ms. Green: 2lbs 4oz/This little gal is calm and cuddly, she sleeps a lot but is playful when she is up and about. Mr. Blue: 2lbs 10oz/Mr. Blue is blocky built compared to his siblings and is a lazy chunky monkey. Mr. Orange: 2lbs 4oz/This handsome "dood" is very playful and loving, he and Mr. Black wrestle often! Eyes are OPEN and babies are on the move! Tessa is still doing a fabulous job keeping everyone clean and fed. They are beginning to really explore one another and are showing infant play styles. Tessa has kept us up and guessing for about 36 hours now... but pups are FINALLY arriving. Send Tessa baby dust and good thoughts for an easy delivery. We will post each pups' birth here as soon as we get a break between each one. Sometimes it is hard to tell whether they are wavy or curly immediately after birth, so we will put it in parenthesis if we are not sure. Mr. Red: Apricot/Gold curly male with small white markings born at 12:55 AM. Healthy and nursing! Ms. Yellow: Red/Apricot curly tuxedo female born at 1:16 AM. Healthy and nursing! Ms. Purple: Red/Apricot (wavy?) female born at 1:25 AM. Healthy and nursing! Ms. Pink: Apricot/Gold curly female with small white markings born at 1:52 AM. Healthy and nursing! Mr. Black: Red/Apricot wavy male with white markings born at 3:06 AM. Healthy and nursing! Ms. Green: Red/Apricot curly tuxedo female born at 3:25 AM. Healthy and nursing! Mr. Blue: Red/Apricot curly male born at 3:47 AM. Healthy and nursing! Mr. Orange: Red/Apricot wavy tuxedo male born at 4:10 AM. Healthy and nursing! I think it is safe to say that we are done with 8 puppies (but don't be surprised if she pops one last baby out in the coming hours... it happens sometimes)! Tessa did a fabulous job and is doing just fine. 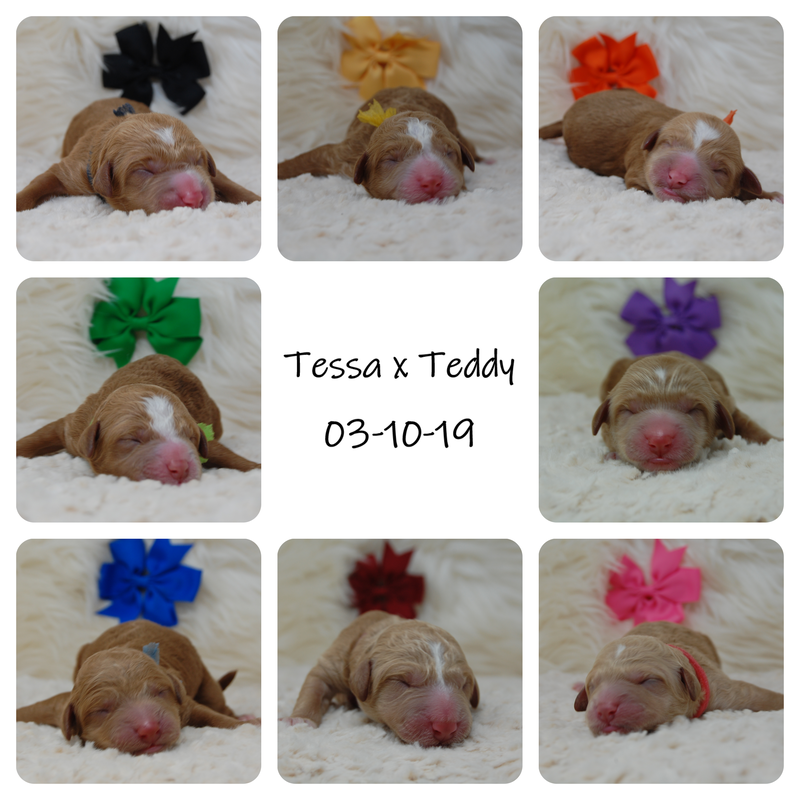 Below is a litter collage for your enjoyment <3 We will add Tessa's litter to the Puppy Cam once mommy and I get a little sleep.